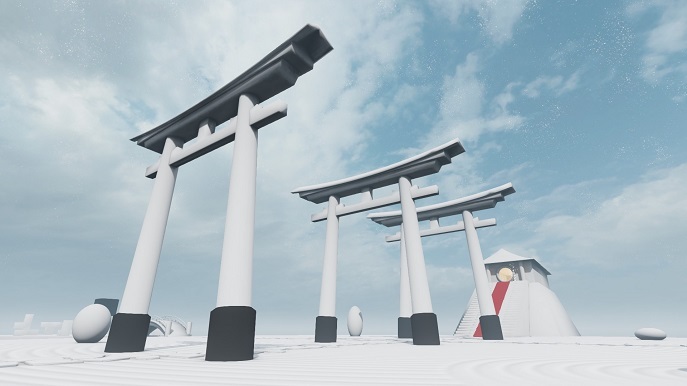 The serene areas that make up the puzzles reflect a peaceful and content dream. 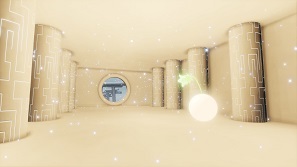 In a minimalist plane with few colours, Niko must solve each puzzle in order to move through the dream and find a way to wake up. Niko: Through the Dream begins with a wonderful (and rather long) introduction sequence with stylised animated pencil drawings combined with an emotive piano accompaniment. This sets the scene to the game as you are dropped into a strange land and given no instruction. 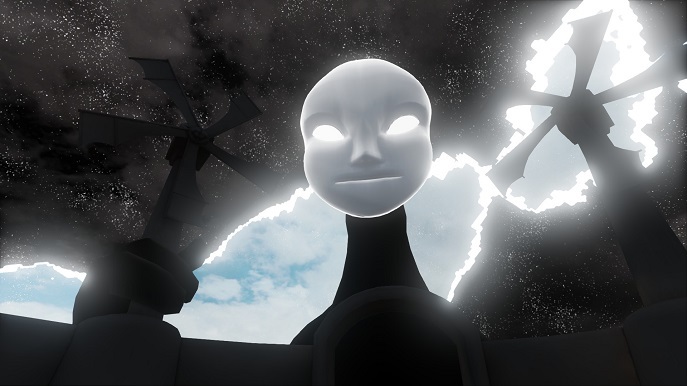 Niko: Through the Dream is a first-person puzzle game that is entirely hands-off. No tutorial or text hints; a reticle appears whenever you are near something that you can interact with. Each puzzle area has its own body of land. Upon completion, the doorway at the end will light up and you can pass through to the next. This allows areas to be visually different, and it's impressive how much variety there is here – both in puzzles and aesthetic. A lot of the puzzles rely on you finding the code somewhere in the area, memorising it, and then entering it in the appropriate way – highlighting blocks in the correct order, lining up shapes to fit a pattern. While this doesn't sound particularly enticing in text, the variety and the sense of discovery will drive you on as you play. The sense of discovery is something Niko does very well. There are secrets to find in each level: animated drawings that give context to Niko's life and a hidden teddy bear to uncover. Not only that, there are some wonderful moments spread across the game; a recurring character that reminded me of No Face from Spirited Away that has a surprisingly strong narrative within the game. 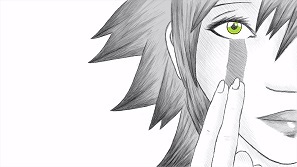 Apart from these moments, the narrative is put to one side for the puzzles. 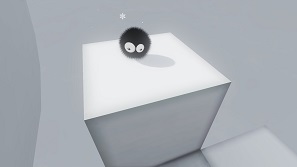 Puzzles aren't repeated in the game; an impressive feat given its four-five hour play time. There is always a solution nearby for a puzzle, it requires a keen eye and some patience. The areas where you have as much time as you like to explore and think were the most enjoyable. Some of the areas reminded me of Mind: Path to Thalamus; changing the weather systems in order to influence the conditions for the puzzle. It was always interesting to see what you were going to find next. Due to the sheer number of puzzle types in Niko, some are not successful. A long swimming section near the beginning is a bit rough. Your breath doesn't last long and movement with a controller was awkward when trying to reach the surface for air. You also had to start from the beginning of the puzzle every time you died. The other puzzles I had issues with were the platforming sections. First person platforming is rarely done well and this isn't an exception. Jumping and movement is loose, making these sections frustrating. The puzzles themselves in these areas aren't particularly difficult, but made all the worse for the movement issues. Another puzzle type involved guiding a ball along a maze in which you have to jump on each block but can do so only once. There was a bug so that up on my controller was right on the screen. This happened on every screen after I failed once (having loaded with correct control movement). It made the section very frustrating and difficult to play through. I ended up managing it with my keyboard and mouse. In fact, by the end of the game I had mostly been using that as the controller was too imprecise. The puzzles near the end of the game get considerably harder but remained mostly logical and fun to complete. With an Antichamber aesthetic, an area near the end of the game has some fantastic puzzles. Unfortunately, there were some prior which were just trial and error; pointing lasers (with poor control) at a wall with no idea what to do was a particular low point. 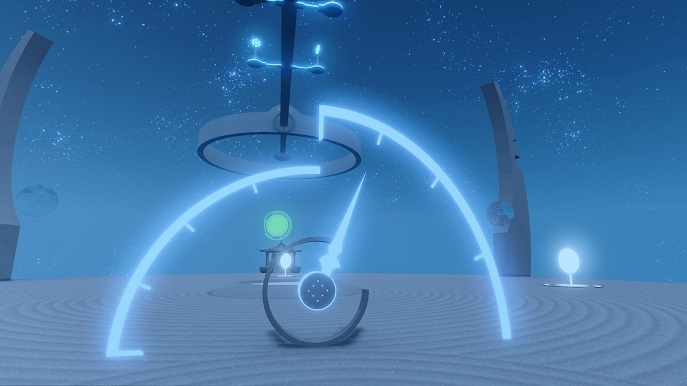 I ran into a couple bugs as well; aside from the control issues I'd occasionally not be able to pick up an object I needed to in order to complete the puzzle. This lead to checking a walkthrough, realising I was correct in what I'd concluded and have to wait for the interaction to work. You cannot reset any puzzles, only restart the chapter. Some of the chapters are quite long (though most aren't) and it was frustrating to have to solve all the puzzles again to reach the one which didn't previously work. Niko's visual design and audio combine to create a strong atmosphere with some wonderful moments. The rare use of colour is especially striking. While the narrative is kept to a minimum throughout the game, the puzzles take centre stage and for the most part are successful. I can recall some which were fantastic and a joy to solve, giving that sense of satisfaction a good game gives. Some were a little ordinary and easy, while some were just frustrating and tiresome. If you enjoy a good puzzle game I'd recommend Niko: Through the Dream. Though some of the puzzles fall flat and cause frustration, most are well designed and fun to solve. While I feel some of the variety could have been cut to keep the quality at a higher consistency, it remains a worthwhile investment. It's a shame that some of the controls are so rough and the infrequent yet interrupting bugs are here. Without these problems, Niko: Through the Dream could have been something special.